Plan Curtail demonstrates through Cuba how with planning a country can lower its CO2 emissions while maintaining high levels of education and public health. The average Cuban generates 2.5 metric tons of CO2 per year compared to 16.2 metric tons for every American. 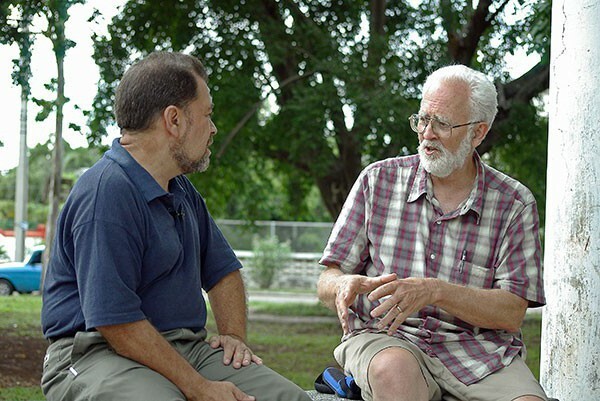 Pat Murphy and Faith Morgan, the staff of Plan Curtail, directed and produced the award-winning film, The Power of Community: How Cuba Survived Peak Oil (2006). The film shows how Cuba developed an extensive low-energy organic agriculture system to survive the collapse of the USSR, which caused a rapid and deep reduction of fossil fuel use in Cuba in 1990. In 2005 Cubans began a campaign of energy-efficiency, and in 2009 had cut their per capita CO2 emissions by an additional 24%. Pat and Faith feel that Cuba, with its strong focus on community values of sharing and cooperation, remains a leading nation in creating and demonstrating the feasibility of a positive low-energy future. We have begun work on our new film about Cuba – see trailer at right. 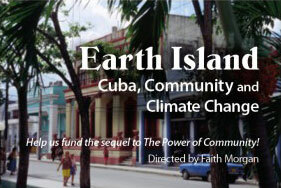 Cuba’s planning and implementation to meet the challenges of energy shortages and the threat of climate change are the subject of Pat and Faith’s next film, Earth Island: Cuba, Community, and Climate Change. Excerpts of Interviews with Cubans for our new film Earth Island, Cuba, Community, and Climate Change. Faith will be filming in Cuba May 2016 for our sequel to The Power of Community (2006). Interviews done while making Earth Island will be posted on PlanCurtail.org as funding allows.